I’ve been wrestling with this one all morning and I’d like to issue an invitation here and now to anyone who can help me out with some sensible facts and figures. Help! Here’s where I’ve got to so far in the story..
2.Various ministers have been working the little cotton socks off their civil servants to get the funding in place. 3. The plan looks good and according NIE they have done the best that they can. 4. The above report (linked in point 3)explains that cost and maintenance reasons are paramount in deciding that it has to be an overhead not underground cable. 5. The people the cable will pass over are unhappy – quite right too! If this was planned for over my head I’d have taken a lot more notice before now! We have substantial evidence in every part of science that there are adverse health effects from exposures. can anyone point me to some of this research that says electricity fields are dangerous? is there anyone who can share their personal experiences of living under these things? Oh… I’ve invited some of the parties concerned to join this debate. I hope they do so. NEW ADDITION to this post on 15.11.07. There has been so much discussion on this issue I thought a small vote might help us make things clear. If you have an opinion you may register it by taking the link below. But… please do keep adding your thought to the debate as well. Poll: What is your view on the North South Electricity Inter Connector? To vote just click on the link above. This entry was posted on Thursday, June 7th, 2007 at 8:30 am and is filed under Consumers, Environment, Health, Ireland, Northern Ireland, Politics. You can follow any responses to this entry through the RSS 2.0 feed. You can leave a response, or trackback from your own site. The Tyrone to Cavan Electricity interconnector will be a very important piece of national infrastructure which will deliver significant benefits to consumers. Northern Ireland Electricity and Eirgrid are in the process of identifying possible routes as determined by a range of physical factors such as, ground conditions, the need to avoid existing infrastructure, centres of population, scenic areas and compliance with relevant regulations and guidelines. The current stage of this process is meetings with landowners to hear their plans for use of the land in order that we can factor that into developing the route proposals. This will allow us to firm up on a preferred route. Once this has been completed we are planning a programme of consultation with individuals and communities in the proximity of the proposed route. This wider consultation is planned for late June and early July. This should allow people the opportunity to communicate any views they might have as regards the project. We should also like to meet again with the Council at this time to address some of the concerns raised. Until such time as we have developed detailed route proposals, it is not possible to provide people with the accurate and detailed information they require. This more detailed proposal should be available for the wider public consultation. The Tyrone to Cavan interconnector will enhance interconnection between the two Irish electricity grids and will complement the existing Tandragee to Louth Interconnector, which has operated without issue for many years and has successfully delivered a range of benefits to consumers. Without interconnection it is demonstrably the case that there would be less competition, higher electricity prices, less generation from renewable sources, and more blackouts across the island of Ireland. The project has the full backing of the Energy Ministers in Northern Ireland and the Republic of Ireland and of both regulators, the Northern Ireland Authority for Utility Regulation (NIAUR) and the Commission for Energy Regulation (CER). Interconnection of this sort is a priority EU policy and commonplace throughout Europe. This proposed interconnector project is the culmination of very careful and detailed studies undertaken jointly by Northern Ireland Electricity and EirGrid. The project will be subject to the full planning process, including an Environmental Impact Assessment. We appreciate that with any large engineering project of this type there will be concerns among local people as to its impact on them and the environment in which they live. We will be making particular efforts to design towers that will best fit with the topology of the surrounding countryside. Having said this there are limits to what can be achieved and the towers, on average, will be around 35m high with a 20m wide base. Putting the proposed line underground would be a very expensive option and would put an unnecessary financial burden on all customers in Northern Ireland. NIE have an obligation to develop the most cost effective solution, taking into account all relevant issues. There are also many practical difficulties with placing a line such as this underground, as explained in the accompanying fact sheet. Some people will have concerns regarding the effects of electric and magnetic fields or EMF’s and there is now a considerable body of research into the effects of electric and magnetic fields around electricity lines. To date over £300m has been spent worldwide, over a period of 25 years, investigating the subject. Unfortunately press coverage sometimes focuses on the more sensational aspects of ongoing research leading to unnecessary concerns. The new Interconnector will be designed to comply with current Government policy and guidelines. There will be a full section on EMF’s in the Environmental Impact Assessment that will be included with our planning submission. As we move forward in the process, there will obviously be more detailed discussions with individual landowners on whose property equipment may be erected. These discussions will cover both the long-term tenure of the towers and any initial disruption during construction works. Thank you so much for the corporate statement and you are just the folks to help out here. -can you point us all to an online location for the proposed route of this connector? -how about someone from your complains department talking about how few complaints you have from people living near the other connectors? -could you say some more about the possible environmental damage and how NIE will avoid it? I’m sure others will also post some questions. Thank you for those links James. Very helpful. I have sent an email to Dr. Coghill inviting him to take part in this debate. He obviously has a lot to say on the subject so we await his input. In the meantime, I’d love to hear something from the people who are living with the various other interconnectors around the country. What is the real life experience of these things? And… despite asking we still have NO idea of the proposed route. NIE saying that they are talking to people about the route isn’t truly helpful. Where is the proposed route map? Is it not available on the internet? If not…why not? Come on NIE….. last time I looked Tyrone was a fairly large county. Which bits is this wire running through? Forgive the corporate nature of this, hope to be able to be more informative in a few weeks once further details are decided upon. It is NIE’s intention that the Tyrone – Cavan electricity interconnector will be constructed at least 60m from existing and planned residential housing. A new and unique tower design has been commissioned to minimise impact on the visual environment. Detailed route details and options will be finalised once discussions with landowners have been completed. A comprehensive programme of public consultation will be undertaken once there is a firm proposal to consult on. Every day of the working week NIE have staff working in close proximity to high voltage equipment. We have no history of resulting illness nor do we have any health concerns for our staff. 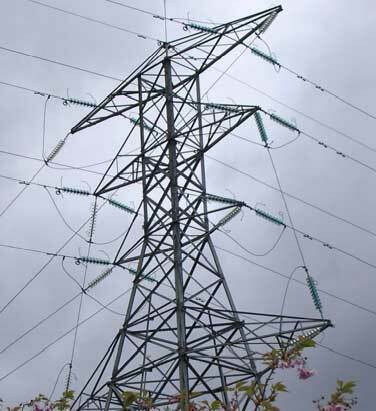 Due to its relatively small network, Northern Ireland’s transmission system, (the heavy duty pylon infrastructure) does not operate at the high voltages that have caused concerns elsewhere. The Northern Ireland transmission system runs at 275kV as against systems of up to 1500kV systems elsewhere. The Tyrone to Cavan interconnector will run at 400kV – which is quite normal in Rep. Of Ireland. Any decision to modify areas of the network is based on technical and commercial criteria. NIE also has a duty to its customers not to undertake unnecessary work as network construction or modifications impact of electricity bills. The views of our customers and public representatives contribute to the decision making process. Even if technically possible under-grounding the Tryone to Cavan interconnector would cost in the region £300m to £500m. Equivalent to circa £500 per electricity customer in NI. This would require regulatory and government approval. The latest and most authoritive report is from SAGE (Stakeholder Advisory Group on Electrical and Magnetic Fields), which includes electricity industry, the Department of Health and the charity Children with Leukaemia. The report concluded the health risks are considered to be extremely low and any precautionary measures associated with power lines are liable to be very expensive. If society were to invest billions of pounds in measures associated with power lines the indications are that there would be very little return with regard to preventing illness. There are many other areas where society could invest money and achieve much greater impact in terms of health improvements. The SAGE report discusses a 60m zone, measured from the centreline of the power line, beyond that EMF’s reduce to negligible levels. It does not indicate that there is a risk inside 60m. As we work to establish a route for the new interconnector we will be attempting to stay at least 60m from any permanently occupied dwelling, either existing or planned.